Our mission: To transform the lives of children, young people and their communities through the power of music making, as part of the international Sistema movement. Our vision: In 5 years, we aim for Sistema England to be a recognised leader in the global ‘music for change’ field, through enabling both high ‘Musical Return on Investment’ and high Social Return on Investment (SROI) for children and young people. Read about our projects here. Sistema England is a member of the Cultural Learning Alliance, a collective of committed individuals and organisations working to ensure that all children and young people have meaningful access to culture. In 2007, El Sistema’s flagship orchestra, the Simón Bolívar Youth Orchestra of Venezuela, conducted by Gustavo Dudamel, takes the BBC Proms by storm. The orchestra comes to symbolise the combination of exuberant and passionate music making with social action, and inspires the formation of hundreds of similar programmes around the world. Julian Lloyd Webber leads on lobbying efforts to the government to bring El Sistema to England. Three pilot ‘In Harmony’ projects are born in London, Liverpool and Norwich, in communities targeted by need and potential for positive impact. The projects embrace the El Sistema principles of excellence and immersive music-making, while forging their own identities and tailored approaches to engage and support their local communities. Globally, programmes inspired by El Sistema serve an estimated one million children in at least sixty countries. 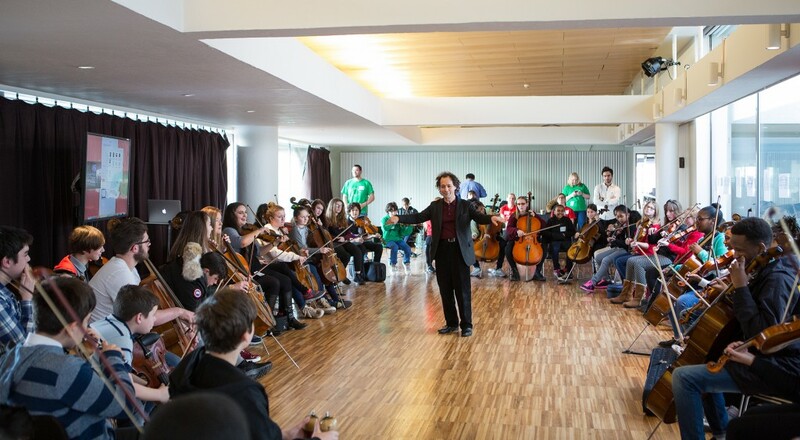 In England, the success of the In Harmony story demonstrates the power of music to transform children’s chances of a better life, and the expansion of In Harmony to Leeds, Newcastle, Nottingham and Telford is jointly funded by the Department for Education and Arts Council England. Julian Lloyd Webber’s charity, Sistema England, adopts a national remit to build and serve the Sistema and ‘music for social change’ community, working closely with four In Harmony programmes and two independent Sistema programmes for shared teacher training needs, international cultural exchanges and to launch the Sistema England Young Leaders programme with the most committed young musicians from each programme. Sistema England continues to work in partnership with other organisations who are active in this field and acts as a major instrument donation bank, transferring instruments into the hands of young musicians to breathe new life into them, where otherwise they would be unaffordable. Sistema England aims to maximise positive impact for children and young people in and through music. Our work will prioritise achieving and helping others to achieve great music (high Musical Return on Investment) and demonstrable social change (high Social Return on Investment). We will do this by prioritising leadership and performing excellence. We will invest in Young Leaders from Sistema programmes nationwide to build their vibrant orchestra and develop as change makers, deliver teacher training to develop outstanding music change makers and bring together the ‘music for social action’ community to develop and share best practices. What is El Sistema? El Sistema is the National System of Children’s and Youth’s Orchestras and Choirs of Venezuela, which is run by Fundación Musical Simón Bolívar. What is a Sistema programme? Programmes inspired by El Sistema vary in their models and methodologies. Programmes in England have agreed these principles. Is Sistema England a branch of the Venezuelan El Sistema? No. Sistema England is inspired by El Sistema’s philosophy of providing opportunities for social and musical development for children who would not otherwise readily have access. We are grateful to El Sistema for their generous support for teachers to come and work with us, their advice, and opportunities to visit and experience their work. More, we are inspired by the specific needs and possibilities of the children, young people, music teachers and communities we engage with across England. Is In Harmony the same as Sistema England? No. The national In Harmony scheme is run by Arts Council England. Sistema England was set up as a charity in 2010, initially called In Harmony Sistema England, to help raise funds for the three In Harmony pilot programmes. In 2013 it changed its name to Sistema England and assumed the wider mandate of supporting all Sistema-inspired programmes in England. I am a music teacher/musician and want to help out… We sometimes need staff and volunteers for our projects. Contact us at sistema.england@sistemaengland.org.uk with your CV and availability. If you are keen to help one of the Sistema programmes you can find their contact details here. How do I make a donation? 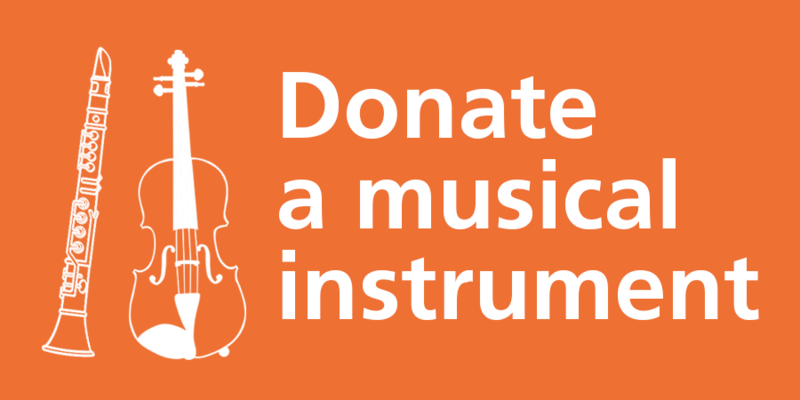 To make an online donation, please go to www.justgiving.com/sistemaengland. You can also send cheques or postal orders payable to ‘Sistema England’ to: Sistema England, Coram, 41 Brunswick Square, London WC1N 1AZ, United Kingdom. If you are a UK taxpayer and using Gift Aid to make your donation go further, please remember to complete the Gift Aid form, which you can download here. What will you do with my donation? You are welcome to specify how you would like your donation to be used. If you do not ask to support a specific initiative, we will consider how your donation can help best us achieve our goals. We will always keep you informed about how we use your donation. Can I donate to a Sistema-inspired programme through Sistema England? The Sistema programmes we work with are capable of receiving direct donations. You will find their contact details here. I have an instrument I would like to donate… Sistema England has distributed around 1600 donated instruments worth £190,000 new to Sistema programmes in England and more recently, abroad – notably to El Sistema Greece. If you have an instrument that is gathering dust on a shelf somewhere, we know a child who can give it new life. We are looking for used orchestral instruments – strings, woodwind, brass and percussion – to be taken on a new musical journey in the hands of a young musician. We are also grateful for donations towards new instruments. To find out more please email Nina Kaye, Trustee of Sistema England, at nkaye@sistemaengland.org.uk. I would like to set up a Sistema programme. Can you help me? Sistema England does not currently provide seed-funding for Sistema programmes. However, our Trustees and team have a wide-range of knowledge, skills and experience that could be useful to anyone that wishes to set up a Sistema programme in England. For inquiries, please email Fiona Cunningham, CEO of Sistema England, at fiona@sistemaengland.org.uk. How do I learn more about El Sistema or the Sistema worldwide movement? You may wish to visit the Change Makers section of our website for more information and links about El Sistema, Sistema worldwide and other ‘Music for Change’ initiatives.